Ahhh…inspired by the remnants of last weeks groceries and wanting to make a batch of hearty chili, today I created yet another gloriously spicy, unexpected batch of paleo chili….this time with pumpkin! Forgive me for the lengthy list of ingredients…I am never one to waste groceries, so I tend to get a wee bit enthusiastic when it comes down to the last few things in the fridge. Although, a lot of these things I always have on hand, because I believe in two things: a well stocked pantry and a well stocked bookshelf! 1. In a large stock pot over a med-high heat add your chorizo and cubed beef. Brown meat 5-7 minutes. 2. Add onion, peppers, garlic. Mix and continue to cook another 3-5 minutes. 3. Add chipotle peppers, beef stock, pumpkin and tomatoes. Add chili powder, salt and pepper. 4. Mix well, bring to a low boil. Reduce heat to medium-low (should be at a simmer) and cook for an hour or so. 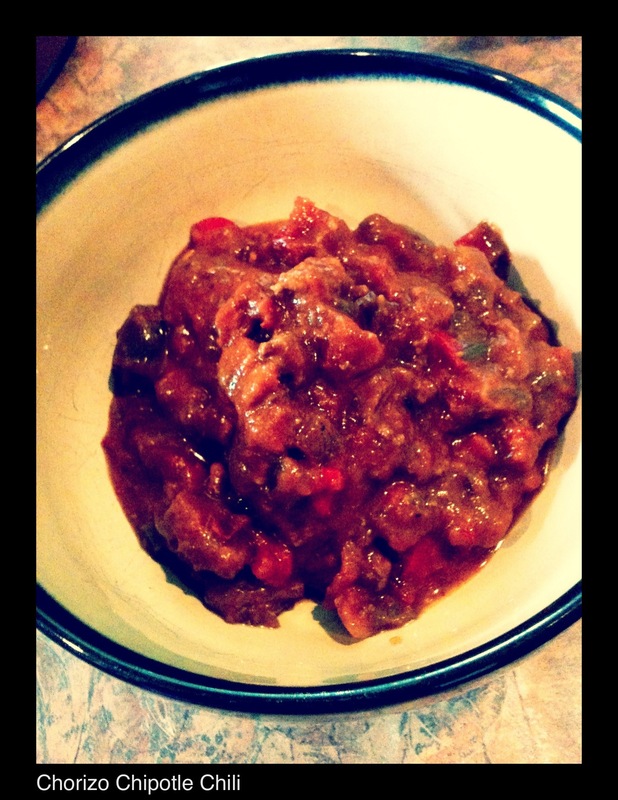 All the flavors will meld and you will be left to enjoy a very hearty, incredibly tasty chili. I would like to thank my friend and Crossfit hero, Kimberly. Our crew went out Friday and she mentioned she was patiently waiting for a new recipe, it really meant a lot to hear that. I’ve been neglectful of my blog due to my injury, but I am ready to get back into it!! So thank you and I hope you like this recipe.